The Backstory Behind "Jake's First Purge"
A few weeks back, I had way too much yerba mate, a highly stimulating South American beverage. The Incas used to drink it. Maybe the Mayans too. You know, the ones with the pyramids and the calendars? The 2012 people? Whatever. All those Mexicans look the same to me. The point is I drank 2 pots' worth of yerba mate. Turns out you are only supposed to have 2 cups' worth in a day! Consequently, the next day, I didn't feel so good. All of a sudden, my mind and body recalled that feeling- that feeling I haven't had since my early college days. That feeling right before. That feeling right before your body purges all that was once good into the toilet - or wherever. Maybe into your workplace trashcan- right, ex-girlfriend? You know who are. That's true, by the way. The point is I puked a bunch. That got me thinking: Maybe it's time I purge some of my act. I have been doing comedy for 10 years now, so I have a bunch of material that has reached its prime. It's as good as it is going to get. Moreover, I'm evolving. Shouldn't my act evolve too? I'm not Aerosmith. I can't just play the same tune for 40 years and call it good. It's time to make way for new things. So, I am purging a bunch of my jokes and stories from my act. So, I took a picture of me pretending to puke. Then, I painted a painting called "Jake's First Purge." That picture is now the cover art for my CD. Back in August 2011, I recorded a bunch of my act at Wits End Comedy Club in Westminster, Colorado. I planned on using 2-3 sets to make a CD. Unfortunately, after recording those shows, I still felt there was a lot more I wanted to purge from my act. So, I pieced together those Wits End recordings along with recordings from Comedy Works in Denver, Colorado, Snickerz Comedy Club in Fort Wayne, Indiana, and Hyena's in Fort Worth, Texas. Basically, all my comedy was either recorded in Colorado or in a city named after a fort. I took all the best chunks from these places and turned them into tracks. There's about 70-minutes' worth of stand-up. I added in 8 minute's worth of bonus material including an excerpt from my new podcast, The Battery Podcast, recorded live at The Bovine Metropolis Theater in Denver. I mixed in my old podcast, The Jesus of Denver Podcast (which had way more listeners than my current podcast). I also sprinkled in some weird voicemails I got from friends and strangers. Lastly I added some comedy songs, commercials, and other weird recordings I made. JAke's First Purge is a 78-minute culmination of some of my best, cleanest, dirtiest, and weirdest comedy. The sound quality is fricking amazing. I didn't want to put out a crappy CD. That's why I waited 10 years. I wanted to wait till I had quality comedy recorded and edited professionally. JAke's First Purge is the real deal. Look for JAke's First Purge on iTunes, Pandora, Amazon, and other places right after Christmas, 2011. You can also download it NOW at jakeisfantastic.bandcamp.com . Here's the thing: I want the CD in everybody's hands regardless of their financial status. So I decided you can pay whatever price you deem fit. Or, don't pay anything. Get it FREE. Whatever. Just go to jakeisfantastic.bandcamp.com and download the CD at whatever price you like. If you download it though, please tell a friend so they can download it too. Comedy-Reviews.com's review of JAke's First Purge! JAke's First Purge is now available on iTunes! 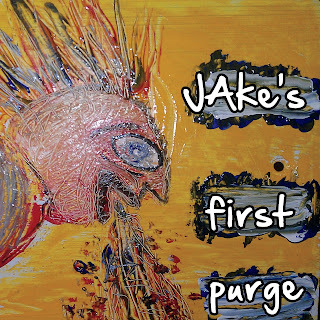 JAke's First Purge is available on Amazon! And of course, JAke's First Purge is still available at jakeisfantastic.bandcamp.com!